Being hired on in any job can be both an exciting and terrifying time. A lot of things are said, decided upon and signed even before you step foot on the place officially. But have you ever gotten through the process and realized that you forgot to mention a few things? Or maybe months later, you wished you had brought up more than you did? Been there, done that, right? It’s hard to go back and broach those subjects. So why not start out right? Be strong and courageous and lay it out straight from the beginning. It does take some…guts…to be forthright about these matters, but at least your employer won’t be grumbling later and you won’t be unhappy with your work situation because your boss doesn’t really know what’s up. There is a glutton of workers in the workforce who don’t have any work ethic. If you were to go into your job each day with an attitude that you desire to bless your boss with the work you do and if you were to work a full days work without arguing or complaining, you will outshine many workers who have come and gone, and those who will follow you. You and your boss will be glad that there are no hidden issues always under the surface making life and work uncomfortable. Here are a few items you may want to consider bringing out into the open as agreements are being made before you hire on. Remember a job interview goes both ways. You are also figuring out if the ranch will be the correct fit for you. Extra Income. 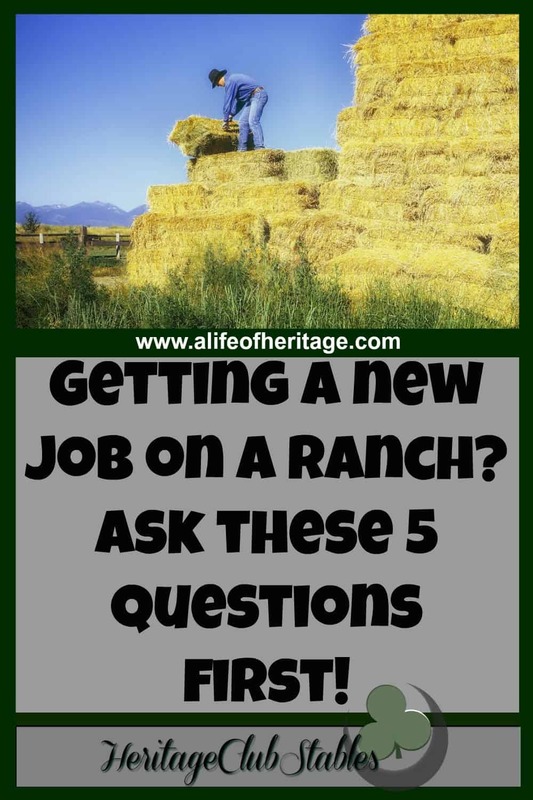 Do you know that your budget won’t be met with this ranch job alone? You know that you may need to supplement income with riding colts for others or training them to sell; or maybe shoeing a few horses a week is necessary to meet the budget quota. Don’t assume that the boss will be OK with you taking off time to make extra money. In his mind he is paying you fair wages and he doesn’t realize that you will be falling short each month. Talk to him about your situation. Be very clear, even showing him the breakdown of your budget, so that he has no doubt in his mind what you are talking about. After you have told him the specifics of your budget and how you would like to remedy the situation, get it in writing. Most people’s minds are in a hundred different directions all at once and what is said can very easily and quickly be forgotten. Getting that pen and paper out will show that this is a serious discussion, not meant to be over looked. It will also bring to light how he runs his operation. If you need to ride outside horses for income, ask a few questions: How often are four wheelers used for day-to-day cow work? How often do you need horses? Can there be afforded more opportunities to use horses? 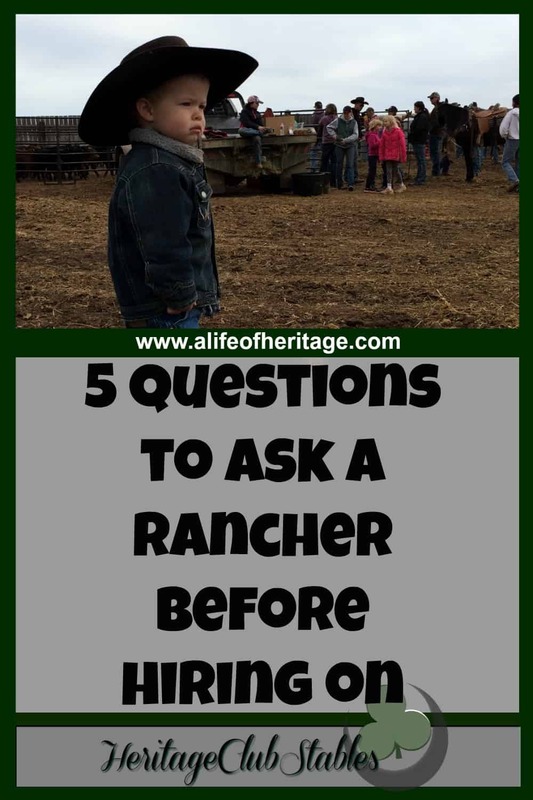 The answer to these questions will really show you if they are willing to have and use horses and if they are willing to work with you to help you meet your needs. 2. Job descriptions. Do you love doing tractor work? Hate it? Find out what will be expected of you. Months down the road, when haying season hits, and you are driving a tractor for hours on end, you may wish you had known what cards your boss had held before you signed on. Your understanding of what is expected may not change the situation but you can mentally prepare yourself for the months ahead. 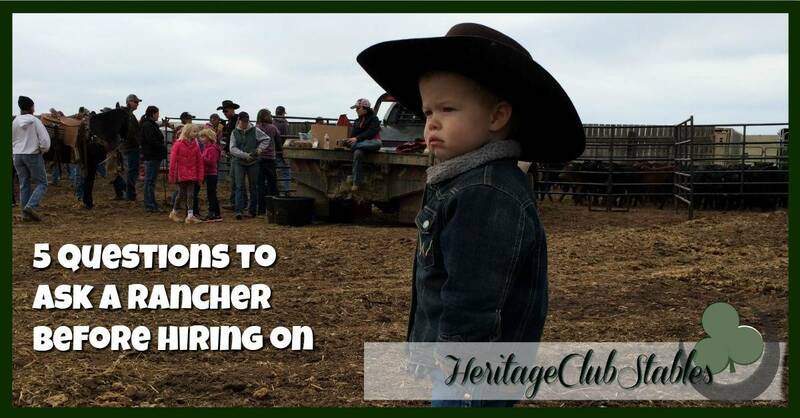 But as mentioned above, if you have made an agreement on the extra income you need, and if part of that income will comes in riding colts, you need to know what will happen during haying season. How many hours do you need to ride and how many hours will you be allowed to ride? 3. Other obligations. Do you have other obligations that you have already taken on? Now is the best time to get them out in the open. It’s better to be hired on with the understanding that it was agreed upon from the beginning about dates and events already planned and spoken for. 4. Family. Do you have a family? Then it goes to say that they are important to you. A ranchers job is never done but you just cannot sell your soul to the company store. Your family needs you just as much and more than your job does. Don’t give away the years your family needed you the most to only regret it later. What will be required of you on a daily basis, including weekends? How many hours a day? Will you be able to join your family for dinners most of the time? Your wife and children will thank you for remembering their value and importance in your life. 5. Other responsibilities. Do you shoe your own horses and/or for the public? Then who will be responsible for shoeing the ranch horses? Don’t let it just be assumed or come to pass that you shoe the ranch horses for no compensation. For each horse, that is a sizable addition to your income that you will be laying down. The hour and equipment that it takes to shoe each horse all adds up. Do you have any other talents that would be useful to the ranch, and that make you more valuable? Don’t sell yourself short. Put it out on the table and know what you are worth. It probably needs to be said that you may come across a more stingy unwilling-to-give rancher who thinks he can find a better deal. In this case it may be worth it to take your resume to the next ranch down the road. If all cowboys would realize their worth, the ranchers wouldn’t be able to find “a better deal”. You would be the better deal and they would realize it. Most of us will find a job working for someone else. We will work for the majority of our lives. It’s time to find the right job for you. It can’t be denied that bringing up these topics, and expecting a decision to be made, will be hard. It’s easy to read about it and even talk yourself through it beforehand. And when your feet hit the ranch’s dirt on interview day, it’s easy to say what you know they want to hear, shake hands and leave. But it is well worth it to forge ahead. Take this on like you would a sullen bull or a broncy ride: clench those teeth, bear down and ride it out. You will be glad you did. If you are a horse owner, you may be interested in our free resource page for horse lovers. It is password protected and updated weekly. So take a moment and sign up below. You will receive an email shortly and will be able to download and print all the helpful resources.